This is a new construction home, permitted and inspected. 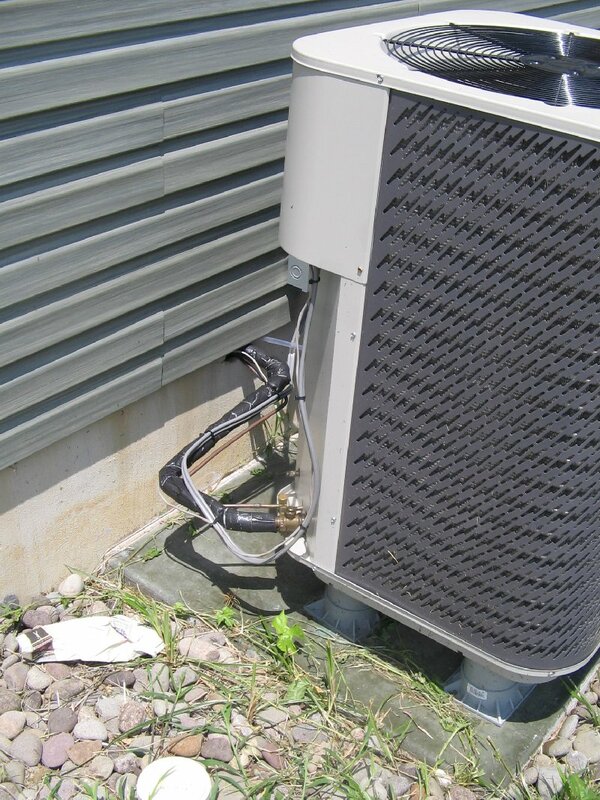 UF to the condenser ??? Note they wrapped the armaflex in black duct tape, I suppose to protect it from the sun. Inspected? I take it that, even in this economy, the AHJ is now hiring! what's that box far behind it? the one with an unpunched KO? I wish I had more hands, to give this install 4 thumbs down. The insulation on the Gas line should be thicker. The liquid line should be insulated. I no doubt have an idea that, that is all the insulation on these lines, I doubt there is any under the building, think condensation problems. I might hear cries of "it doesn't get that cold here", but if you read the manual of any A/C / heat pump unit they specifically say that all copper lines shall be insulated up to the ports on the unit. New gasses mean that the pipes are carrying higher pressures (think R-404A). In some environments, it isn't hard to blow a bit of liquid line, if not insulated, sunlight will often help. Add moisture, we've all seen copper turn green, that is the start of corrosion. All of a sudden you have customers peeved at losing all their gas. This is my BILs new dream house. He is so frustrated at the quality of the trades that built it he calls it the nightmare house. Several things had to be torn out and replaced. The county threw every roadblock they could at him in plan review (a no-growth agenda) but once construction started I believe inspections were a "drive by" affair. My wife just shook her head and said she would not have paid for lots of stuff in that house but she was a builder. We tried not to point out too much but we think he was robbed. Hey Reno, perhaps they hired in the Park Dept. 's gardeners!